Whether you are looking at an upscale dining option, or a no-frills place with fantastic and mouthwatering food, the Hilton Head area offers some of the most diverse dining options in the state. You can experience fresh and exotic seafood at one of the casual seafood restaurants on the Island, if you are looking for a fun place with a relaxed atmosphere to enjoy your dinner. If you want to experience some fine dining, you can choose from among numerous elegant restaurants at various price points. Even the pickiest of food connoisseurs are going to be pleased with the exclusive preparations of some of the top four-star restaurants in Hilton Head. Many of the local restaurants specialize in seafood varieties such as oysters that are prepared in different styles to please every type of seafood lover. Restaurants in the area also celebrate traditional seafood festivals with special preparations such fish fry, shrimp boil, and oyster roast. Southern staples such as corn and rice are combined with clams, crab, and shrimp to offer delightful dishes with a local flavor. The restaurants use the freshest of local foods to ensure that you experience the real taste of area’s food. The popular Skull Creek Boathouse’s Marker 13 Buoy Bar is situated on the north end of the Island. It has earned a rank among the Top 30 Outdoor Bars in the United States by Travel & Leisure Magazine. This wonderful place sits on the spectacular banks of Skull Creek, and overlooks the Pinckney Island Wildlife Preserve and the Intracoastal Waterway. 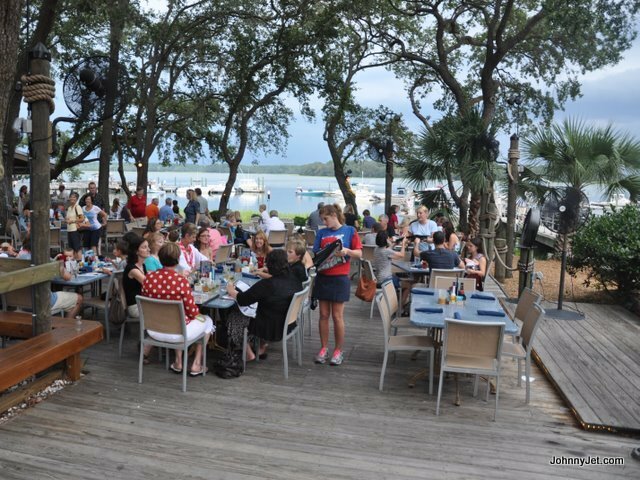 The Buoy Bar offers an open air experience with panoramic vistas of the magnificent sunsets of Hilton Head. The original Truffles Café is the place to choose if you are looking for some casual and jovial place after a few hours at the pool. Flamingo’s Doughnut Café in the area is a unique design-your-own-doughnut shop and also offers made to order cake doughnuts.